1. I find it unacceptable that PSI 3 should commence a download of an update from the internet without my explicit consent for each and every one. For instance, I might be on an expensive or limited-bandwidth connection at the time. 2. In any case, I prefer always to fetch my updates from the original vendor, with the options that I choose, and not through 3rd-party updaters, where I have no idea what options have been chosen for me. For instance, PSI 3 has just downloaded a LibreOffice update, but does not seem to have downloaded the HelpPack for my locale. Had I permitted this update, I would have ended up with an incorrect locale of LibreOffice. 3. I find it unhelpful that PSI 3 does not reveal the full path to the outdated component. For instance, my PC has many copies of NPSWF32.DLL scattered about the disk as part of 3rd-party installations, but PSI will update only one of them, and still flag the others as outdated. 4. If you release PSI 3 in a design close to the present beta, will you retain availability of PSI 2 for those who prefer to see the details? Me too. Could be a nice feature to have an alternative download, but not as standard. I have installed the 3.0 and deinstallit after 5 minutes. For a security tool, i don't wonna see icons. I wonna know, what I and my software are doing. With this interface, the security isn't secure, because you don't know, which programs where found with what solution. 3.0 = Easy, but not useable. Actually, Secunia did not state in the FAQ that "versions 1.5 & version 2 will remain supported". All they say in the FAQ is that "versions 1.x and 2.x are currently supported", which is hardly news when version 3.0 is a beta! It doesn't look good. If Secunia really did have plans, either to keep 2.x up to date, or to build all its functionality back into an "Advanced" button, then after all the huge fuss of the last few weeks, wouldn't they be stating this unambiguously in their official FAQ? Is it too pessimistic to suspect that, after a suitable pause, Secunia will abandon up-to-date support and bug-fixing for the present 2.x functionality? 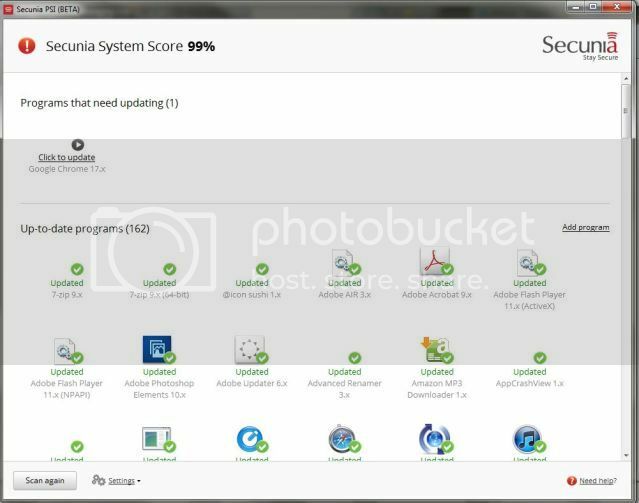 At which time, the great majority of its current users will reluctantly stop using any version of Secunia, for the simple reason that version 3.0 is useless and dangerous. At the very least, Secunia's communication to its committed users over the past month has been very poor indeed. "With this release, we aim to satisfy the typical end-user, such as your uncle or grandmother, who may have had trouble relating to the overflow of information found in the PSI 1.x and 2.x series." I happen to be a great great uncle twice over, and first learnt computing using minigol on a Physics Department computer in 1966. Insulting older users does not help Secunia's cause. I'm new to Secunia PSI and tried the PSI 3.0 beta. I too think, that the 3.0 interface is to easy. For people who have no idea of an Computer it's fine but for users who do know Computers this interface is not at all helpfull. 1. I don't like it if any program only shows me a few icons and says I update them now! Aha what exactly you are updateing now, which version, from where you download it? 3. People who are not so good with the PC could think after the update through PSI now is everything good but is it? I didn't see a list with all my installed programs where I can see which programs are checked from PSI and which not and which version is available/which have I. 4. I want to know what a program is doing please give me informations in a clear interface but not a very clear interface with no information. I think the new interface is good for example here: I install it on the computer from my mom and the available updates get installed automatically, perfect but from time to time I log in and make a advanced check which all the informations I can get to be shure everything is really good. I will try this evening the PSI 2 and hope that the interface there is much better. Just removed 3.0 and reinstalled 2.0. Why? 1. i have Wireshark Portable 1.6.5. PSI 3.0 just added normal installation of 1.6.6 x86 on my Win7x64. Would this be the same if i let PSI 2.0 autoupdate? 4. The non tech savvy people are in all languages and colours. PSI 3.0 is only English. 5. Do not redifine the word Beta. A beta level software is nearing the final state. This released PSI 3.0 is just a tech preview. Just updated to v 3. Where's the friggin' dashboard? This interface tells me nothing, and as other posters have stated, downloads start automatically, we have no control. When I start hearing better things about v 3, I may reinstall. For now, I'm going to search for my trusty v 2! For the record, always loved PSI, believed in it, use it continuously. Sure hope I can go backward now. 1) I'm going to start with a questiion why was the "official 3 beta" thread locked? Thank you for starting this thread. 2) Next I'm going to go back in time to show that the new method of "ignoring" zombie files is a confusing choice. After all, if the file is executable, it is software, it's location nonwithstanding (Installed software usually goes in %ProgramFiles%). The Secunia PSI 2.0 tries to handle this better than previous versions by grouping results from the same program into one entry. If, for example, you have had Google Chrome on your system for a while, and have installed 5 upgrades, you will have 6 Chrome installations, who will all be picked up by the PSI. In the new version, only the version information from the most recent install (the one that will be used if the installer works by sane parameters) is the one that counts in the PSI UI. If any "Zombie Files" (leftover files from dead installations) are noted, the PSI will report their prescence (And their numbers, in the "#" column). As mentioned above, to the PSI there is no difference between "installed" and "non-installed". There are only scanable files, and perhaps a matching signature (which would result in a program being detected). What if I'm keeping Firefox 3.14 portable on my drive for webtesting purposes. Suddenly it's FF 11? 3) I'm still trolling through the 2.x Beta thread, but I seem to remember many being in an uproar about the removal of simple mode from 1.X. I think this 3.x is a reaction in the extreme to some people liking Simple and other people Advanced, or in my case maybe liking 3.x on some machines but not others. a) this version continue to update? and we have a floating updated version, or 2 or three. b) not update and leave users vulnerable. In the case of PSI 2.x when "grandmother" called tech-savy "grandson" (or neighbor, or Best Buy employee) said indvidual (the latter one not the former) could look at the read out of PSI and go "hey you have a copy of opera browser in your temp files, i'll get rid of it for you. but I am upset about the way the other thread seems to have been closed because they were tired of hearing from us (an assumption I've made because of the lack of indication that it was going to be closed nor an explanation as to why it was closed and a new "official thread" was not opened. I wish to add my endorsement of the previous complaints in this thread about the new PSI 3.0 beta release. I downloaded this this morning and tried it for several hours, but decided that in its present state it is definitely not for me! So I uninstalled it and reinstalled the earlier version 2.0. Like the others in the thread, I find the lack of useful information in the beta to be appalling! I do not want updates, even from PSI, to my software without my explicit permission. I normally update from the originator's site, not through the PSI mechanism. This is more reliable without question. The example of the problem today with OpenOffice.org 3.3.0 is a case in point: The link given by PSI was useless; it was unable to fix the issue. Fortunately, there was a fix described by another user in the PSI forum that was appropriate and even solved the problem. I want full control over updating. That is the only way to avoid issues like the one just mentioned. and CSI the one for corps and 50+computer outfits? I think Beta 3.x is actually a great idea as a CSI agent program, if the server is gone it'll keep updating and CSI server (i Assume) will be able to monitor and manage PSI 3 as it does PSI 2. But, as a standalone program, i feel it's a setback, people don't want to learn about security,and that's a bad thing. PSI 3.x buys into that but treats it as a given and doesn't try to change people's attitude, and that too is a bad thing. My feeling are the same ....PSI 3.0 right back to PSI 2.0 From what I'm hearing PSI 3.0 not a big hit. Beat me with truth....Don't turture me with lies! Just tried the 3.0 beta. I too I'm going back to 2.0 right now. I'm not interested in nanny products of the "don't worry, I know what's good for you" type. I installed the (very useful, thanks!l) PSI 2.0 because I preferred to disable all auto-updaters and stay informed on vulnerabilities. 3.0 does not seem to be designed for this; in fact it goes very far in the opposite direction. Moreover, it gives almost no information while 2.0 was very detailed and informative. If you think Joe Average User will use it, you're probably mistaken. If you think a computer professional will use it, I'm sorry to have to say it, you'd better have a reality check. Switching from a professional approach to the the consumer market is a tricky move that requires vast resources and a lot of research and preparation, or it'll probably end very badly and tarnish the company's image too. Just ask RIM. P.S. Why does it show all "up-to-date programs" with a red exclamation point? sorry ... I will uninstall PSI3.0 immediately from my computer! It's not because I don't believe your skills to write a good PSI programm ... it's due to your stupid user interface. I feel taken as a fool by you ... (like oftenly by Microsoft) ... because I'm an engineer. Just some baby big colourful icons and the green "Ok." tickmark may be enough for a simple thinking user. But this is the very wrong marketing approach for any serious user. I would expect some user interface which (as minimum) has a simplified and an advaced option (b.t.w. I don't like icons very much ... sometimes - and especially in this case of PSI - a list with details is much better for security transparency). Neverteheless the "KISS"-approach (keep it simple & stupid) can be used for any user interface ... a simplified "housewife"-IF and behind an more advanced one for more skilled users, e.g. with same helpful contents like PSI2.0 up to now (incl. EOL management). 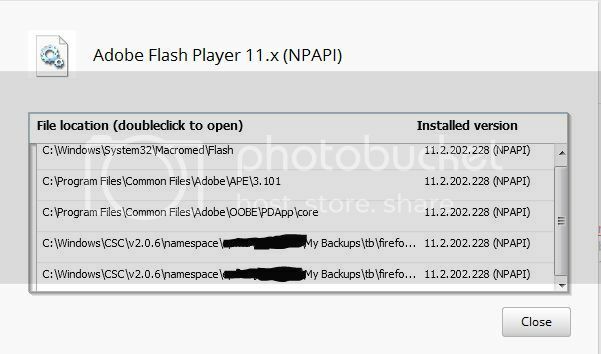 With this PSI3.0 ... what to do if I've detected that PSI is not recognizing useful or neccesary updates ... just these days a critical Adobe Flash Player 11.2 Update was not noted by my PSI after scan, and even an old Faststone Image Viewer 1.1 on my PC is reported from PSI as green (up-to-date) since ages ... while Faststone 4.6 is already available since 2011-06-29. With PSI3.0 you are providing a wrong sense of security ... and you make us users disabled to help you! Errors are part of our world ... no reason to hide - keep PSI (interface) transparent for the whole user comunity ... only from mistakes we can learn and become better! Last edited on 1st Apr, 2012 18:34 I have been thinking about this new apparent direction of Secunia PSI and I have a few considerations and a suggestion. This is based on the assumption that Secunia intends to target normal users with no technical skills (I can see no other possible explanation for the new interface). 1) Perhaps not a big problem (possibly an already solved one) but worth noting: a potential infinite loop. - PSI sees a new safer version exists that fixes some vulnerabilities. - PSI downloads and installs it automatically. - (sooner or later) PSI sees a new safer version exists that fixes some vulnerabilities. 2) This is a lot more serious: PSI automatic updates can break systems. I updated ImageMagick by downloading it via PSI. For some reason it didn't install Perl::Magic; maybe I missed a choice or there was some unsatisfied version requirement (my Perl is too old? ), I don't know, but that's not important. What's important is that an automatic update can break the connection between programs (e.g.application A uses application B and requires a specific version of B; updating B can break A. Actual dependency chains can be, and usually are, a lot more complex than this - note that the separate applications could have been set up by a common installer that took care of the dependecy requirements). In my case, the missing piece made a perl-based html->ps converter break, which in turn made an ebook generator unusable. I knew this could happen, so I'm not surprised and I certainly do not blame PSI for suggesting the update. But consider an automatic update on a normal user's PC that indirectly breaks one or more applications. Who's going to pay for that? My suggestion is: if you've decided to reach for the consumer market, think very carefully about the support implications and plan for the legal and monetary cost of unintended consequences. Just removed 3.0 and reinstalled 2.0. For me, there has to be an expert mode. Only by using 2 tabs, you can satisfy the whole community. First tab has the interface of 3.0 and second tab thew 2.0. Everybody can use the one he likes and if someone needs help by a crack, it can change to the expert mode without uninstalling the "idiot" mode. Thing is that ends up being a lot like PSI 1.x, not that I'm complaining as I also think that and was sad to see it go in 2.x but it might still look as a backwards step. Remember that yes we are allowed to voice our opinions, but those opinions are always BEST voiced by substancial constructive critisisms. Note these last Few paragraphs are NOT aimed at the poster quoted above, nor anyone in particular, it's just a statement that: "Yes, I too, am upset and fisty shakey about PSI3 in it's current form but Secunia has ALWAYS worked with us in the past to make PSI a program that we both love and install on computers that are our's and our "Grandmothers'. " As for constructive criticism, sometimes comments may sound harsh but I think they may serve Secunia's best interests better than diplomatic understatements. In my experience , Secunia do listen to relevant feedback and are notoriosly bad at responding/updating(?!!) the Forum on a regular - if ever - basis , thereafter . If you wish to have any influence on future design , rather than merely filling up thread space , then take Nergali's advice ; offer constructive criticism with the more detail the better . That said, please go try Beta2 (with a 3 promised to come with even more features). Will it be useful? I don't wanna try and deinstall it. I need the options from 2.x. If it doesn't allow me to see, which program does it scans and which status they have, I don't wanna switch to 3.x. I don't wanna try and deinstall it. I need the options from 2.x. If it doesn't allow me to see, which program does it scans and which status they have, I don't wanna switch to 3.x. Stick with 2.x. let us beta testers get 3.x to be more the speed that a user might want. I think that that is the best move for you, in particular, and anyone else in or reading this thread, who don't feel they meet with requirements of Beta Testing. I have PSI on ~30 computers, it behooves me to particpate in the 3.x Beta as I'll want those computers to work right when it is released, but I've not placed 3.x on those computers, or even on my main computer, because it IS a beta. We have decided to go ahead and lock this thread. This is not to stiffle or censor the debate about the PSI 3.x beta, however, it is preferred that you now continue this discussion in the PSI 3.x Beta 2 thread, so we avoid any confusion about which features are and are not currently included in the PSI 3 Beta. You are of course also welcome to create new threads specific to this release of the PSI Beta as much as you want.